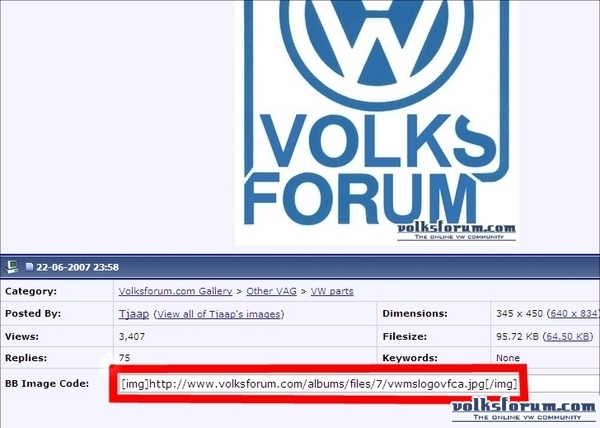 Volksforum.com - how to post pictures! 1: click on gallery in the menubar and click "upload picture" on the dropdown menu. 2: click browse, choose a picture from your computer, fill out the rest of the info, choose a category and hit upload. 4: add the BB image code to your reply. 1: click on the picture with your right mousebutton and select properties. 2: copy the URL adress of the picture. 3: In your reply click the "insert image button" (the yellow square with the mountain in it). 3: paste the URL adress into the pop-up that appears. Last edited by Tjaap : 23-12-2009 at 09:05.